Police are today questioning Ryan Donovan who is believed to have shot two senior officers, killing one of them, on a nuclear submarine before his deadly gun rampage was stopped by a council leader. 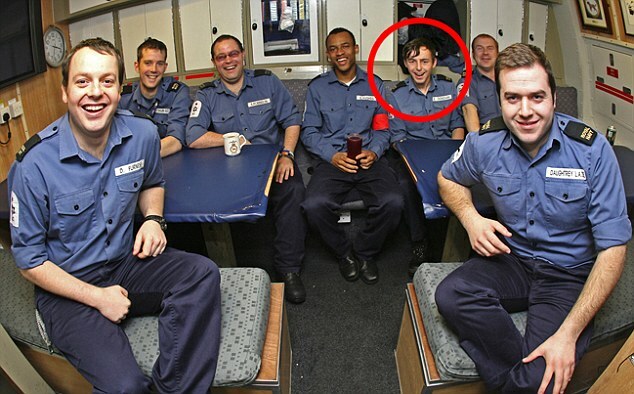 Pictured less than 48 hours before the alleged incident in the control room of a nuclear submarine, he can be seen smiling with his ward mates, unaware of the violence that would follow two days later. 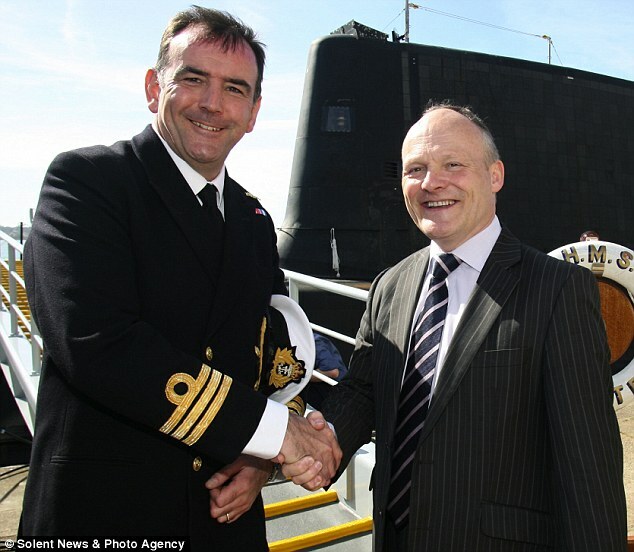 Captain Phil Buckley, Captain of the Faslane Flotilla to which HMS ASTUTE belongs, said: ‘Ian Molyneux was a thoroughly professional and competent submarine engineer and a great asset to HMS ASTUTE and the Royal Navy’s Submarine Service. Admiral Sir Mark Stanhope, First Sea Lord said: ‘This is a very sad day for the Royal Navy and in particular the Submarine service. 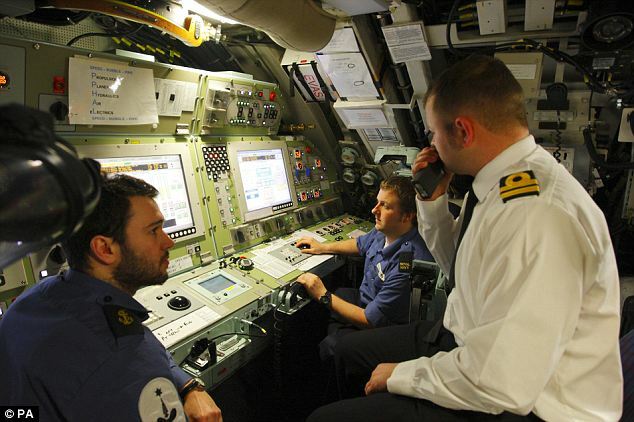 Our submarines are crewed by a highly professional cadre of sailors, many of whom are actively involved today in operations in the North Atlantic, Mediterranean and Indian Ocean. ‘This incident is indeed tragic and the Royal Navy, in cooperation with the Hampshire Constabulary will investigate this incident fully. 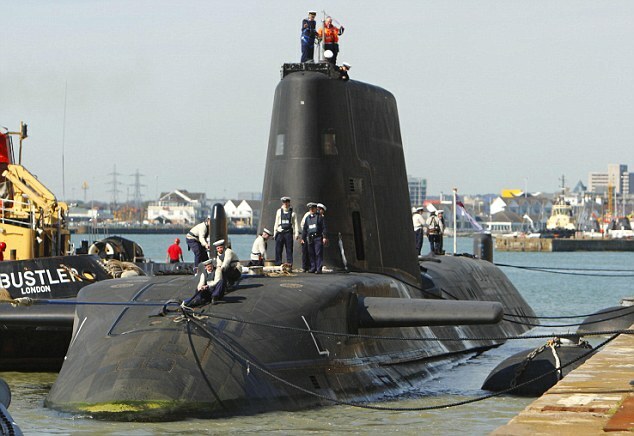 The gunman was overpowered by a visiting council leader, Royston Smith, who last night described the extraordinary scenes on HMS Astute, a £1.2 billion attack submarine. ‘A guy appeared in his gear,’ he said. ‘He had all his body armour and camo on and was carrying a weapon, not a handgun, an SA80. ‘The first two shots I heard, I didn’t see. Three and four were reasonably close. Fortunately most people were out of the way. ‘He was stood in the doorway. I was about five yards away. I didn’t think about it but took a decision that if I didn’t stop him I might get hit or other people might get hit. Mr Smith, 46, who served in the RAF as a mechanic, said the gunman made no noise during the struggle. ‘I was shouting a bit. That wasn’t successful so I threw him, charged him against the other wall,’ he added. ‘I managed to pull the rifle away from him. ‘In the first tussle he let off shot number five. I felt something but it didn’t hurt. There were about five or six shots in total. 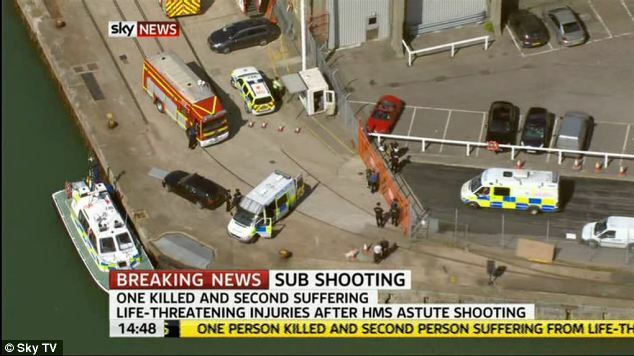 Schoolchildren – aged 14 to 16 and on a visit to the vessel in Southampton Docks – ran for cover when the shooting broke out. 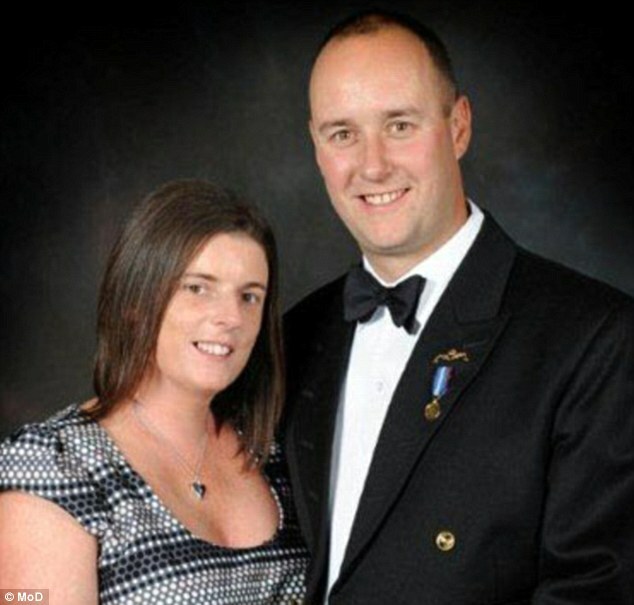 The dead man is Lieutenant Commander Ian Molyneux, the submarine’s weapons engineering officer and a father of two who was in his thirties. He was due to transfer to the Navy’s second Astute class sub, HMS Ambush, and was second in rank to the submarine’s commander. 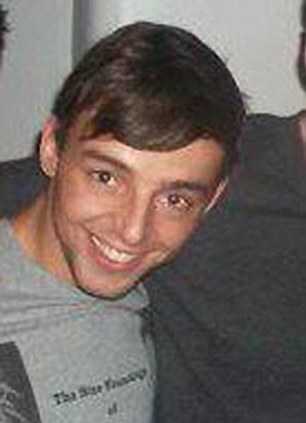 The man accused of firing the shots is believed to be able seaman Ryan Donovan, 22. 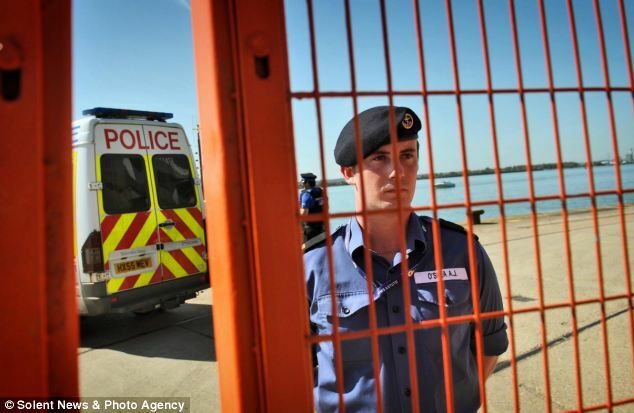 He was under arrest last night and is said to have snapped after being refused shore leave. Donovan, wearing body armour and camouflage clothing, is alleged to have taken his Navy issue SA80 and fired six shots. 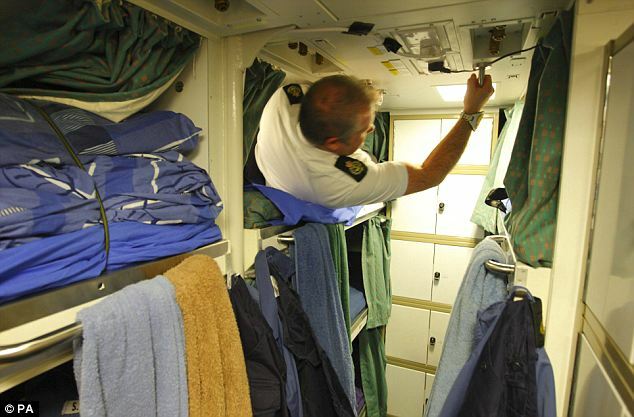 Colleagues said the 5ft 6ins sailor had been pressed into carrying out his previous tour of duty, despite being due shore leave, The Sun reported. 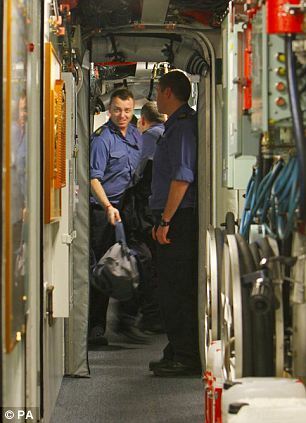 He was believed to be dreading spending another month at sea on more exercises due to start on Monday. Reports also claimed the rating snapped after he was told he could not use a toilet because visiting dignitaries should go first, The Times reported. A Ministry of Defence source told the newspaper: ‘With civic dignitaries on board, toilet arrangements were stretched to the absolute limit. Mr Smith, a Tory who became leader of the city council last year, added: ‘People were in shock. Most people didn’t do anything but we only had seconds. I wasn’t going to take it lying down. Mr Smith was on board with city mayor Carol Cunio and council chief executive Alistair Neill. They all escaped injury.The Ministry of Defence confirmed the shooting was not related to terrorism. A security review will now examine the case for tighter controls on those allowed to carry weapons on nuclear-powered submarines. The gunman’s psychiatric state will also be examined. Police plan to speak to 30 witnesses to the midday incident. Last night Alec Samuels, a Tory councillor, told the Daily Mail: ‘I’ve heard that Royston Smith helped to overpower the gunman. ‘I’m not surprised because he is an extremely energetic and courageous fellow. That is exactly how I would expect him to respond. ‘He has been keeping fit by climbing mountains to raise money for injured British soldiers coming back from overseas conflicts. 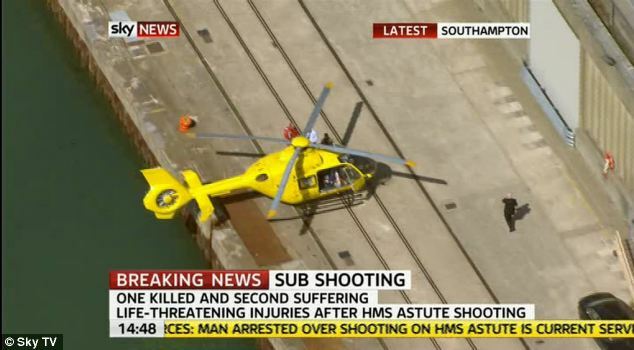 Armed police, firemen, paramedics and the Hampshire and Isle of Wight Air Ambulance helicopter were sent to the dockside where the submarine had been berthed since Wednesday. The vessel had been due to stay in the port for five days, on a public relations mission. Brian Cedar, who lives at the city’s marina, said: ‘I saw at least six people carry a stretcher off the gangway into a waiting ambulance. 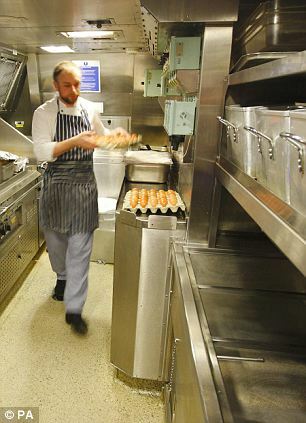 The HMS Astute has faced embarrassing setbacks since being revealed as one of the UK’s newest and most powerful attack submarines. The 97-m long vessel – the flagship of the Navy’s submarine fleet and ‘the stealthiest ever built in the UK’ – can carry up to 38 Spearfish heavy torpedoes and Tomahawk Land Attack Cruise missiles. But the sub, which at 7,800 tonnes weighs the equivalent of 1,000 double decker buses, has been beset by problems since it was commissioned in August 2010. Two months later it ran aground on a shingle bank in the Isle of Skye and had to be towed free after 10 hours. Last December the £1.2 billion Astute suffered a mechanical failure during sea trials off the Scottish coast and was forced to limp back to its home port of Faslane. The sub is the first of seven new nuclear-powered submarines of its class, with its nuclear reactors meaning it will not need refuelling in its entire 25-year life. The vessel is faster underwater than it is on the surface and is capable of speeds of 20 knots – though its official top speed remains classified. Hampshire Police spokesman Alan Smith said: ‘There were a number of naval personnel plus visitors on board at the time of the shooting. ‘What happened forms part of the investigation which is at a very early stage and everyone who was on board is a potential witness. HMS Astute had been scheduled to host visits from Sea Scouts and school and college pupils from Southampton and the New Forest. Defence Secretary Dr Liam Fox said: ‘I am greatly saddened to hear of this incident and of the death of a Royal Navy service person in this tragic incident. ‘It is right and proper that a full police investigation is carried out and allowed to take its course. 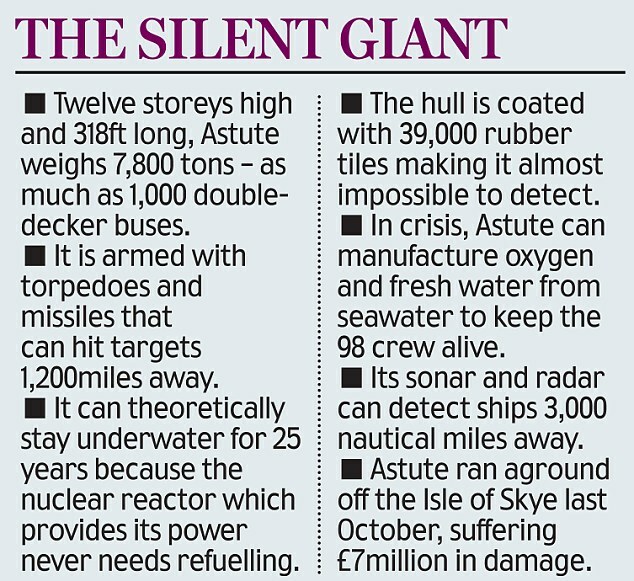 Astute hit the headlines when it ran aground on a shingle bank between the Scottish mainland and the Isle of Skye and remained marooned for several hours. 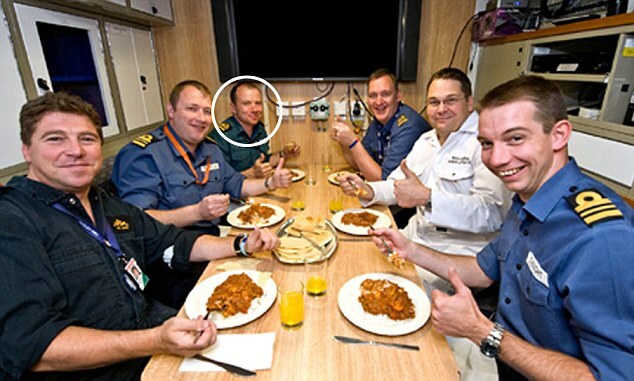 The embarrassing incident in October last year cost Commander Andy Coles his command of the submarine. Crouching in the bushes along the banks of the river that separates Liberia from Ivory Coast, two young Liberian men in filthy clothes and flip-flops agreed to a recorded interview after a small payment was made. They described how they had just returned home from a nine-day operation with pro-Ouattara rebels, where they said they were told to kill “anyone and everyone”. They described barbaric scenes in which they surrounded villages in the west of Ivory Coast and, armed with machetes, killed everyone they saw. “The town we entered first, most of the people were on the road. We killed them, just cutting them with our machetes,” they said. Now in the safety of a transit camp in Liberia, refugees fleeing from Toul�pleu spoke of the horrors they witnessed there. They described how they grabbed family members and escaped from their homes in a hail of bullets. Whoever and whatever were left behind were burned. The Audgines were also grieving for a loved one killed after the rebels set fire to their home. “I can’t even eat, I feel such sadness now,” said Rosaline, mother of nine, whose elderly father was burned alive. She said she could do nothing to help him, as he shouted to them from within the flames. She and her children are a few of the many people in the camp who have shaved their heads in a traditional gesture of mourning. The International Red Cross recently reached Toul�pleu, and said it found a town almost completely razed to the ground. HRW has documented the executions of elderly people who were unable to escape rebel attacks. 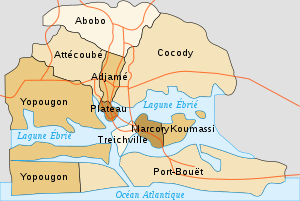 It says they were held captive in their villages by the pro-Ouattara rebels, and has evidence that more than 30 were executed. One 67-year-old woman from the village of Dok� told HRW that pro-Ouattara fighters had taken several captives out each day – often men and women between 60 and 80 years old – and executed them at point-blank range. The pro-Ouattara forces have denied killing civilians in their advance upon Abidjan, blaming any deaths on Gbagbo’s soldiers. Those standing guard at the border crossing with Ivory Coast near Toe Town, eastern Liberia, were in victorious mood when interviewed by the Guardian. In their smart camouflage gear and with AK47s slung around their necks, they swaggered up to the barrier across the bridge between the two countries. The conflict threatens to cause a wider humanitarian crisis in the region. More than a million people have been internally displaced within Ivory Coast, while more than 125,000 have crossed the border into Liberia, a country that itself has been devastated by 14 years of civil war. Many Liberian communities are sheltering refugees, but barely have enough food for themselves, and there are fears the crisis will destabilise Liberia’s fragile peace. Colonel Gaddafi‘s regime has sent one of its most trusted envoys to London for confidential talks with British officials, the Guardian can reveal. Mohammed Ismail, a senior aide to Gaddafi’s son Saif al-Islam, visited London in recent days, British government sources familiar with the meeting have confirmed. The contacts with Ismail are believed to have been one of a number between Libyan officials and the west in the last fortnight , amid signs that the regime may be looking for an exit strategy. Disclosure of Ismail’s visit comes in the immediate aftermath of the defection to Britain of Moussa Koussa, Libya’s foreign minister and its former external intelligence head, who has been Britain’s main conduit to the Gaddafi regime since the early 1990s. A team led by the British ambassador to Libya, Richard Northern, and MI6 officers embarked on a lengthy debriefing of Koussa at a safe house after he flew into Farnborough airport on Wednesday night from Tunisia. Government sources said the questioning would take time because Koussa’s state of mind was “delicate” after he left his family in Libya. The Foreign Office has declined “to provide a running commentary” on contacts with Ismail or other regime officials. But news of the meeting comes amid mounting speculation that Gaddafi’s sons, foremost among them Saif al-Islam, Saadi and Mutassim, are anxious to talk. “There has been increasing evidence recently that the sons want a way out,” said a western diplomatic source. Although he has little public profile in Libya or internationally, Ismail is recognised by diplomats as being a key fixer and representative for Saif al-Islam. According to cables published by WikiLeaks, Ismail represented Libya’s government in arms purchase negotiations and as an interlocutor on military and political issues. “The message that was delivered to him is that Gaddafi has to go, and that there will be accountability for crimes committed at the international criminal court,” a Foreign Office spokesman told the Guardian , declining to elaborate on what else may have been discussed. One idea the sons have reportedly suggested – which the Guardian has been unable to corroborate – is that Gaddafi give up real power. Mutassim, presently the country’s national security adviser, would become president of an interim national unity government which would include the opposition. It is an idea, however, unlikely to find support among the rebels or the international community who are demanding Gaddafi’s removal. Britain learned that Koussa wanted to defect when he made contact from Tunisia. He had made his way out of Libya in a convoy of cars after announcing he was going on a diplomatic mission to visit the new government in Tunis. It was also reported that Ali Abdussalam Treki, a senior Libyan diplomat, declined to take up his appointment by Gaddafi as UN ambassador, condemning the “spilling of blood”. Officials were checking reports that Tarek Khalid Ibrahim, the deputy head of mission in London, is also defecting. The prime minister insisted that no deal had been struck with Koussa and that he would not be offered immunity from prosecution. “Let me be clear, Moussa Koussa is not being granted immunity. There is no deal of that kind,” Cameron said. Within hours of his arrival in Britain, Scottish prosecutors asked to interview Koussa about the 1988 Lockerbie bombing. The Crown Office in Edinburgh has said that it is formally asking for its prosecutors and police detectives to question him. But government sources indicated that Britain does not believe Koussa was involved. He was at the heart of Britain’s rapprochement with Libya, which started when Tripoli abandoned its support for the IRA in the early 1990s. William Hague, the foreign secretary, said he had a sense that Koussa was deeply unhappy with Gaddafi when they spoke last Friday. “One of the things I gathered between the lines in my telephone calls with him, although he of course had to read out the scripts of the regime, was that he was very distressed and dissatisfied by the situation there,” Hague said. Two headless bodies are dumped on a street in suburban Mexico City along with a message sent by a mysterious group called “The Hand with Eyes.” Days later, a severed head shows up in a car abandoned outside an elementary school in the same suburb. For drug lords, this sprawling metropolis of 20 million has been a favorite hide-out and place to launder money, making Mexico City somewhat of an oasis from the brutal cartel violence along the border and in outlying states. Now a spate of killings and decapitations never before seen have authorities batting down fears that a once-distant drug war is making its way into the capital. Instead, they say, the violence since late last year comes from street gangs fighting for an increasingly lucrative local drug market. While drug use in Mexico City doesn’t come close to that in the U.S., it has grown dramatically in the past decade. About 8 percent of middle and high school students here now experiment with drugs, said city drug addiction adviser Patricia Reyes, a number that has climbed from 2.5 percent in 1998 according to national surveys. Some of the high-profile violence comes from groups that are remnants of the Beltran Leyva cartel, which has splintered and moved closer to the city since the Mexican navy killed leader Arturo Beltran Leyva in December 2009. Others imitate cartel tactics to gain turf. The mass killings started late last year, when a drive-by shooting in the rough neighborhood of Tepito killed six youths and a family of five was slain in a drug-related attack in the south of the city. The violence intensified earlier this year as Juan Vasconcelos, a reputed local gang assassin, allegedly went on a cocaine- and alcohol-fueled killing spree that ended with his arrest in February. The first attack left five people dead on Jan. 8. Another killed eight people Jan. 16 and the third left seven dead Feb. 13. Police say Vasconcelos has ties in Mexico state to La Familia cartel, based in the neighboring state of Michoacan. While that alliance wasn’t fueling the violence _ Vasconcelos went after rival drug dealers and members of his own gang to consolidate his power _ it made it easier for him to get high-powered weapons. Then mutilated bodies started showing up, unheard of in the metro area, leading the news media to blame big cartels, including the vicious Zetas gang, and saying the military now patrols parts of the metro area like it does in border cities and other drug hot spots. The Mexican army denied to The Associated Press that it has patrols in or around Mexico City. “What we have here is drug dealing, and I’ll say it again: Drug dealing is not considered organized crime,” Mexico City Attorney General Alejandro Mancera was quoted by the newspaper Milenio as saying earlier this month. Mancera did not respond to several requests to be interviewed by the AP. Mexico City, which still struggles with robberies and high kidnapping rates, has long been considered infested with crime. But murders are dramatically lower in the capital than in northern Mexican cities, where drug violence has been raging for at least four years, and people who long feared the city are now moving there to escape drug violence elsewhere. Mexico City’s homicide rate was about nine per 100,000 in 2010, lower even than many U.S. cities, including Washington, D.C., which had 22 per 100,000 last year, according to government statistics. The northern border city of Ciudad Juarez had a staggering 230 per 100,000. Because many of the country’s wealthy live in the capital, it has long been a neutral place for traffickers to do business undetected and live with their families behind tall gates. According to a recent federal police report, six of the major drug gangs operate in all 16 delegations of Mexico City proper. While they leave each other alone, the police go after them. Capos have been picked up while jogging in exclusive neighborhoods and caches of weapons have been found in mansions. At least four top members of the powerful Sinaloa and Juarez cartels have been arrested in Mexico City, including the son of Sinaloa cartel boss Ismael “El Mayo” Zambada and the son of the now deceased Amado Carrillo Fuentes, founder of the Juarez cartel. La Familia, a newer cartel formed in 2006, began expanding into the suburbs from Michoacan as President Felipe Calderon launched a crackdown on the cartel in his home state. Now, they have a presence northeast of the capital, where they run drug, extortion and car theft operations, Castillo said. Still, the major cartels tend to lay low. There is a strong police presence, with 90,000 officers assigned to the 16 boroughs, plus the Mexico state police patrolling areas surrounding the city. The capital is also where the army, navy, and federal police are based, something that may inhibit traffickers from launching the brazen attacks seen in other places. “There is an enormous reactive force concentrated in Mexico City and because of that, drug traffickers have to maintain a low profile,” said Martin Barron, a crime expert at the National Institute of Criminal Justice, a government think tank. But tensions and violence among local gangs have flared to new levels. So far the attacks are relatively few in number, but drug-related killings have increased from 135 in 2009 to 191 in 2010, according to the Mexican government. Days later, a car with a severed head on the dashboard and the rest of the body in the back seat was abandoned in the same area. The new gang has been beheading local drug dealers who refuse to join its ranks, Castillo said. Associated Press writer Gloria Perez in Mexico state contributed to this report.